Assessing cropping systems in the Maritimes to enhance soil productivity and resiliency. The project is collecting samples for soil health assessment from across the Maritimes’ diverse cropping systems, including this forage field. An ambitious project is providing comprehensive information on soil physical, biological and chemical properties for agricultural producers in Nova Scotia and Prince Edward Island, and developing tools to help these producers make more informed decisions on how to enhance their soil health and productivity. Lynch explains that, across North America, agricultural scientists and others are using soil health frameworks for monitoring and measuring the effects of different practices on soil properties. That’s because soil health is such a crucial issue – for agriculture, for rural landscapes and for climate change. Healthy soils perform vital functions like nutrient retention and cycling, water infiltration and storage, and suppression of crop diseases, weeds and insect pests. These functions not only support healthier crops, but also enable the landscape to better tolerate extreme weather conditions and help reduce greenhouse gas emissions. However, soil health frameworks aren’t one-size-fits-all. For instance, the priority of particular soil health issues tends to vary from region to region. 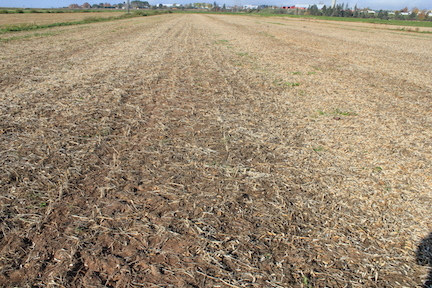 In one region, soil compaction might be the most pressing concern. In another region, it might be soil-borne crop diseases. In yet another, it might be low soil nutrient levels. So Lynch and Burton are working to develop a soil health framework that is specific to P.E.I. and Nova Scotia. The project, which runs from 2016 to 2021, aims to assess the effects of different cropping systems, management practices and soil types on soil health, soil carbon storage capacity, and soil nitrogen supply. The project is collecting soil health data from farm fields and research plots across the region, analyzing the samples, building a database, and conducting multiple studies that are approaching soil health considerations from different angles. “Soil health, soil carbon storage capacity, and soil nitrogen supply are closely related to each other. But some project aspects are primarily focused on soil carbon, which I’m leading, and some aspects are primarily focused on soil nitrogen supply, which Dr. Burton is leading. Soil health is the umbrella that links the two,” Lynch explains. He highlights a few examples of the project’s studies. “With soil carbon, for example, we’re looking at existing models that say the potential for soil carbon storage is enhanced as silt and clay content goes up, and we’re asking: do those models apply to our primarily coarse-textured soils? Or is the potential for soil carbon storage in this region much more driven by dynamic properties [which are affected by agricultural practices] rather than inherent properties [like soil texture]? “Another example of what we’re looking at is: how low can we go with soil carbon? Soil carbon is declining in certain cropping sectors here, so is there a tipping point below which we get a wider impact on soil health? The project will develop tools to answer growers’ questions like: would adding soybeans to my rotation add enough residue to enhance my soil’s health? Photo courtesy of Derek Lynch. “This is really a partnership project, with funding through Agriculture and Agri-Food Canada’s Agricultural Greenhouse Gas Program (AGGP), and a collaboration with two regional partners and the agricultural community,” Lynch notes. The regional partners are the P.E.I. Department of Agriculture and Fisheries (PEIDAF), and Perennia Food and Agriculture Inc., a Nova Scotia government extension corporation. To help in building the soil health database, PEIDAF and Perennia identify possible farms to be sampled and they make the initial contacts with the producers. Then for each participating farm, Burton and Lynch’s project team works with the producer to choose a representative field to be sampled. 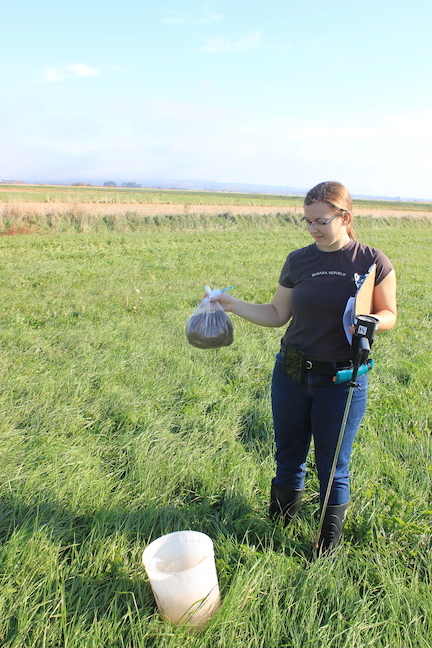 The project team is using the Cornell Soil Health Assessment Framework as a starting point, adjusting that framework’s sampling and analysis procedures to meet the region’s needs. The team is using about a dozen different soil health parameters, which provide a comprehensive evaluation of soil physical, biological and nutrient/chemical properties. “Our aim is to develop a database using those comprehensive tests across different agricultural sectors, different farms, and different research plots in Nova Scotia and P.E.I.,” Lynch explains. The number of sampling sites varies from year to year. Over the past three field seasons, the project team has collected over 1300 samples. The samples are analyzed at the Atlantic Soil Health Lab. This unique research lab was launched at Dalhousie University in 2017 as part of the project. Each sample’s soil data and field history data are entered into the database, resulting in a powerful resource for soil health research and tool development. The project team shares the key findings with the participating producers. “We provide the data for their own field, and we present that data relative to their peer group, so a vegetable producer’s data is compared with the average for all the vegetable producers in the region, and relative to the average for all types of cropping systems in the region,” Lynch says. “The data we have collected so far supports some previous research in the region showing that, in some cropping systems, soil organic matter is low and declining. On the majority of fields, it is less than three per cent and often significantly lower than that particularly for more intensive, low-residue cropping systems like potato and intensive vegetable production,” Lynch notes. In 2019, the project team will be continuing the soil sampling, lab analyses, database development, and information sharing with producers. And they will continue their soil health studies, such as the work on a soil carbon tipping point and regional drivers for soil carbon storage and soil nitrogen supply, as well as various other studies. For example, some of the research is identifying which particular soil health parameters are the most meaningful, sensitive and robust measurements for P.E.I. and Nova Scotia conditions. That information could allow the researchers to obtain regionally relevant data with fewer types of measurements. A related study is taking a detailed look at the different fractions of active soil carbon (as opposed to stored soil carbon) and seeing how well each fraction might correlate with improvements in soil health. Some upcoming research, to be conducted once sufficient fields with different BMPs are sampled, will aim to identify which specific BMPs offer the greatest soil health benefits. In addition, the project’s database will be supporting tool development and other activities by PEIDAF and Perennia. How healthy are Ontario soils?